Our Ecosure 500 litre Adblue dispenser, is manufactured in our UK factory using premium quality steel. 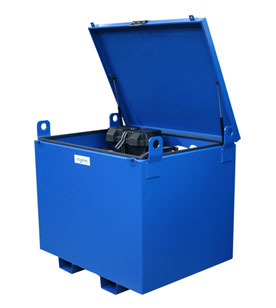 The outer bund of this 500 litre Adblue dispenser is laser cut from high quailty steel, while the inner fuel tank is rotationally moulded ensuring strength and precision engineering. You can choose between either a 12v, 24v or 230v 500 litre Adblue dispenser. All dispensers come standard with an automatic nozzle and lockable lid, for added safety. 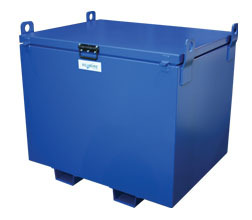 Safety is of high priority, so we offer our dispensers to have lockable lids. With its easy to use pump, compact size and forklift pockets, you can now dispense Adblue on the move. 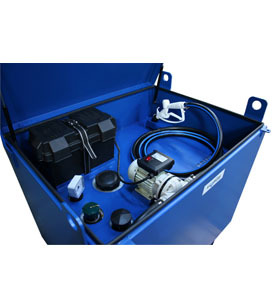 Our 500 litre Adblue dispenser is perfect for agricultural, industrial and commercial use. Max. flow 35L/min. Manual on/off switch. .